In his historic visit to the island—the first by a US president in 88 years—Obama declared an end to the Cold War in the Americas. “I have come here to bury the last remnant of the Cold War in the Americas. I have come here to extend the hand of friendship to the Cuban people.” Thus did President Obama salute a historic transformation in US-Cuban relations in his speech today at the Gran Teatro in Havana, in the first visit to Cuba by a US president in 88 years. The audience included Raúl Castro and other Cuban dignitaries; the grande dame of Cuban dance, Alicia Alonso; and a delegation of US senators, representatives, and business leaders. “Somos todos Americanos,” the president added, to applause. A new chapter has indeed begun in relations between the two countries, as the president completes a series of formal and informal meetings with Raúl Castro, while his business-oriented entourage holds talks with Cuban entrepreneurs and economic ministers, and the Tampa Bay Rays take on the Cuban national baseball team in a display of béisbol diplomacy. In timing, tone, and agenda, the trip represents Washington and Havana’s high-profile effort to “seal the deal” after the dramatic accord to normalize relations, announced simultaneously by both presidents on December 17, 2014. When President Obama arrived at the Palacio de la Revolución on Monday morning for his meeting with Castro, he found an actual red carpet awaiting him on the marble stairs of the entrance. Both countries had taken steps to set the popular stage for this presidential summit. Just before leaving for the island, Obama participated in Cuba’s version of a Saturday Night Live–style skit with the country’s most popular TV personality, Luis Silva. The comedian plays a clownish character named Panfilo on the mostly widely watched weekly program, Vivir del Cuento. Panfilo’s running gag is that he is always trying to call the White House, but the president never answers. Then, on the episode just before the trip, Obama actually picks up the phone. With humble Cuban hospitality, Panfilo offers to pick up the president at the airport in a ’58 Chevy and tells Obama that he can “drink beer and play dominos” during his stay. “I’m impatient to come,” Obama tells Panfilo. “The American and Cuban people are friends.” But, Obama adds, speaking adequate Spanish, “No es fácil”—it isn’t easy—to take this momentous step. “It isn’t easy, but it isn’t difficult either!” Panfilo responds. On the eve of Obama’s visit, both nations made key announcements to ease the normalization process. On March 15, the administration issued a series of regulatory modifications to the embargo that addressed longstanding demands of the Cuban government. Through executive order, Obama ended the Treasury Department’s punitive fines on multinational banks handling US dollars from Cuba, normalizing Cuba’s ability to use such currency to finance commercial transactions. Obama also authorized Cubans to receive paychecks for work in the United States without having to immigrate. The order, which applies to artists, academics, consultants, and any other Cuban professional working on US soil, also resolved requests from Cuban sports officials that Cuban baseball stars be able to play for the major league teams without having to defect. For its part, the Cuban government announced that it would lift the 13 percent exchange tax it has imposed for years on US dollars, increasing the purchasing value of US currency on the island. Just hours before Obama arrived, the government signed its first agreement with a US corporation since the 1959 revolution: a multimillion-dollar investment agreement with Starwood Hotels and Resorts to manage and provide services for several large, new—and badly needed—hotels in Havana. Behind the scenes, however, the two governments have wrangled forcefully over difficult issues that continue to impede harmonious ties. As the historic trip approached, the Cuban government sought to establish the parameters of peaceful coexistence, given the dark history of US hostility toward the island, and reasserted demands for the embargo to be completely lifted. 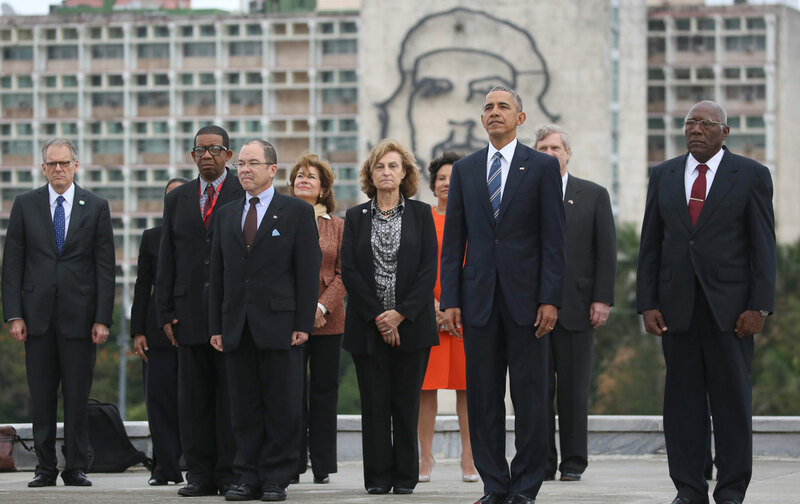 On March 9, the official Communist Party newspaper, Granma, published a forcefully worded, three-page editorial titled “The Visit to Cuba of President Barack Obama.” Addressing the Cuban people and official Washington, Cuba’s leadership made clear that Obama’s trip reflected the strength of the revolution, not weakness. No one should assume that Cuba had to “renounce any of its principles or cede the slightest bit in its defense” to receive the US president, the editorial declared. The Cuban leadership proudly asserted its contribution to the process of engagement, and reiterated its demands for full normalization of relations: the lifting of the embargo; return of the Guantánamo naval base to Cuban sovereignty; a formal end to USAID “democracy” programs and to US support for dissidents on the island. The United States “should abandon the pretense of fabricating an internal political opposition, paid for with money from US taxpayers,” stated the lengthy editorial. Obama’s trip was filled with encounters and experiences that, as he himself admitted, would have been unimaginable just a few months ago. Among the most memorable was that of the president and his family sitting in the front row of the Estadio Latinoamericano at the beginning of the baseball game, alongside Raúl Castro and his family, doing “the wave” together, as hundreds of white doves circled over the infield.